One of the first things you notice about the gray fox, Urocyon cinereoargententeus, is how red it is. Enough red, in fact, to make you wonder whether you're actually looking at a gray fox or something else. Enough red that some call it the red-sided fox. This is an animal that prefers to stay in brushy cover deep in the woods, and away from humans. More on that in a bit. Their main diet is small mammals — rabbits, mice and rats — but they also eat birds, reptiles and amphibians, bugs and berries. They're not uncommon animals in South Florida, but they are uncommonly seen. For one thing gray foxes are nocturnal and, again, they prefer brushy cover. Even if they're active during daylight hours, odds are long that you'll spot one. The photographs on this page were shot late in the evening — the fox emerged from the brush, paused for a few seconds and continued on his way back into the brush. It is the only fox we've seen in the year-plus that we've been putting together this website. 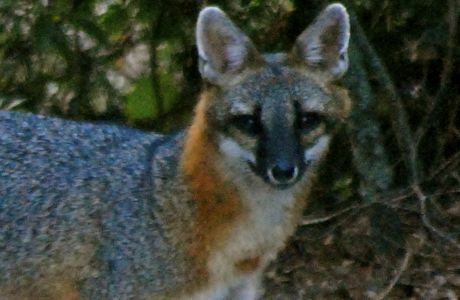 Like other species, the gray fox has had much of its preferred habitat disappear as the human population expanded. They haven't gone away, but have adapted to more suburban settings and the bits and pieces of wilderness that remain. This guy was spotted at the 25-acre Crystal Lake Sand Pine Natural Area in a section of Pompano Beach surrounded by development. We've also seen them years ago at Seacrest Scrub Natural Area, another small, suburban preserve. More nuts and bolts: gray foxes average three to four feet in length, with as much as a third of that being tail. They can weigh as much as 13 pound, which is less than you might think looking at one. Unlike other canines, they hunt alone. Unlike other canines, they can climb trees, which they do for defense and sometimes for shelter. Like other canines, they are territorial, marking their turf with urine and scent. 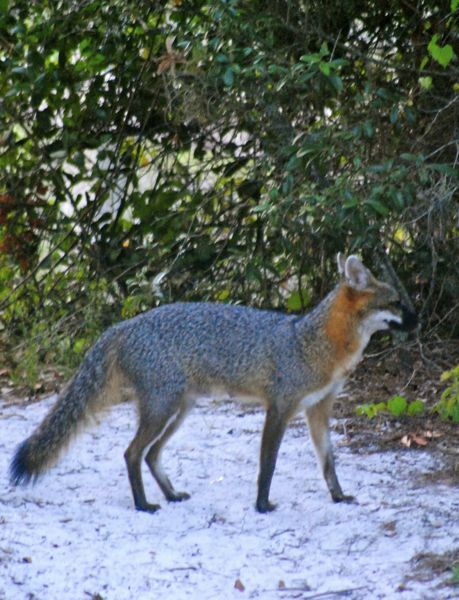 Gray foxes will dig a den, or they might find a gopher tortoise burrow and convert it to their own use. They'll also use a tree hollow or crevices in a pile of rocks. They breed between January and March; typically, the mother will give birth to three to five pups after a gestation period of about two months. The pups are blind and helpless, nurse for another two months, and will remain with their parents for four more months. Both male and female raise the pups, providing food, protection and training. Their native range includes most of the United States except for the northern plains and Rockies. Their range also includes southern Canada and southward through Mexico, Central America to Colombia and Venezuela. They are more numerous in North Florida than South Florida, but they are found throughout the state. Fun fact: despite the cliche, you're not likely to find foxes anywhere near a henhouse, according to the Florida Fish and Wldlife Conservation Commission. While they wouldn't mind downing a chicken or two if given the opportunity, they don't like to venture out of their preferred habitats that much, and they don't like being around humans, either.